The people of south-east Florida are getting a brand new train line over the next couple of years, and if the branding is anything to go by, they are in for transport treat. The company behind the venture is called Brightline. 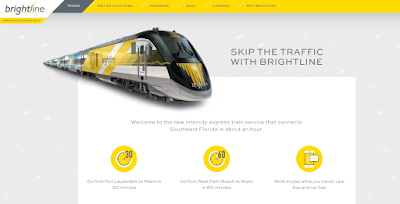 According to their website, the company is set to offer 'a new express train service that is reinvigorating a century old railway to connect the cities of Miami, Fort Lauderdale and West Palm Beach, with a Phase Two expansion to Orlando. Our modern, soaring stations are located near places you want to be, and connect you to commuter trains, buses and rideshare options that will get you where want to go. We’re proud to be changing the future of Florida’s transportation for the better'. Find out here how the Americans are doing things (route branded trains anyone?) this country can only dream of.